Police Chief Jack Conklin has served the City of Brea for 24 years. He began his law enforcement career with the Brea Police Department in 1989 when he was hired as a patrol officer. Chief Conklin was appointed Chief of Police in December 2010. He leads a department of highly trained, professional men and women committed to excellence in service. Brea Police Chief Jack Conklin began his law enforcement career as a deputy sheriff with the Orange County Sheriff’s Department in 1986. In 1989 he joined the Brea Police Department as a patrol officer. In 1991, he was assigned as school resource officer serving five Yorba Linda elementary schools returning in 1995 to patrol as a corporal where he served as a field training officer. He was promoted to the rank of sergeant in 2000 and after spending two years in patrol as a field supervisor was assigned as the department’s first ever Professional Standards Sergeant where he served for three years as the department’s press information officer, primary internal affairs investigator and supervisor of the school resource officer program. In 2005, Conklin was promoted to the rank of lieutenant and was assigned as a patrol watch commander. As a lieutenant, he also served as a Yorba Linda Area Commander and directed the recruiting effort for the entire department. In September of 2007, Jack returned to the Professional Standards Unit, this time as the unit’s manager. He served in this capacity until his promotion to captain in May of 2008. 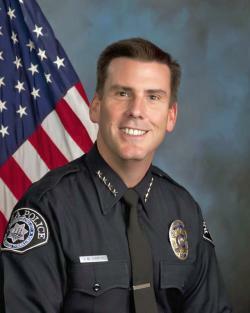 As a captain, Conklin completed a two-year assignment as the Chief of Police Services for the City of Yorba Linda (Under a contractual agreement, the Brea Police Department provided police services to the City of Yorba Linda for 42 years) before being named the Uniform Services Division Commander. Conklin held this position until his promotion to Chief of Police on December 11, 2010. Chief Conklin was born in Los Angeles, California and raised in Huntington Beach. He earned a Bachelor of Science degree in Occupational Studies and a Master of Science degree in Emergency Services Administration from California State University, Long Beach. He is also a graduate of the Sherman Block Leadership Institute.